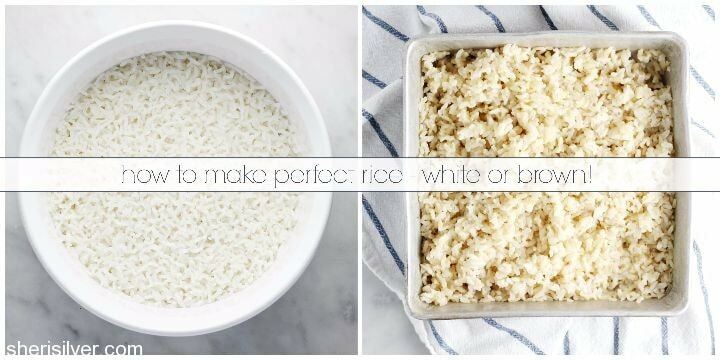 101: perfect rice – white or brown! While not the most exciting dish, it IS a staple around here – the base for many of our favorite foods. And while we’ve expanded to other grains – farro, couscous – and even occasionally, quinoa – white and brown rice are the ones we return to time and time again. I don’t know about you, but I’ve had very inconsistent success with making white rice on the stovetop. I can never seem to get the flame adjusted just right, and wind up either scorching the rice or undercooking it. And brown rice? Forget it. I’m sure it’s super simple, yet I’ve never been able to get nice fluffy results with traditional cooking methods. Years ago I discovered the best ways to make both. They require zero attention and yield absolutely perfect rice every time! Let’s start with white rice. Place 1 cup of rice, 2 cups of water, 1 tablespoon of butter (or oil) and a pinch of salt in a covered, microwave-safe bowl. Cook on full power for 5 minutes. Reduce power to 50% and cook for an additional 15 minutes. Let sit for 5 minutes, fluff and serve! 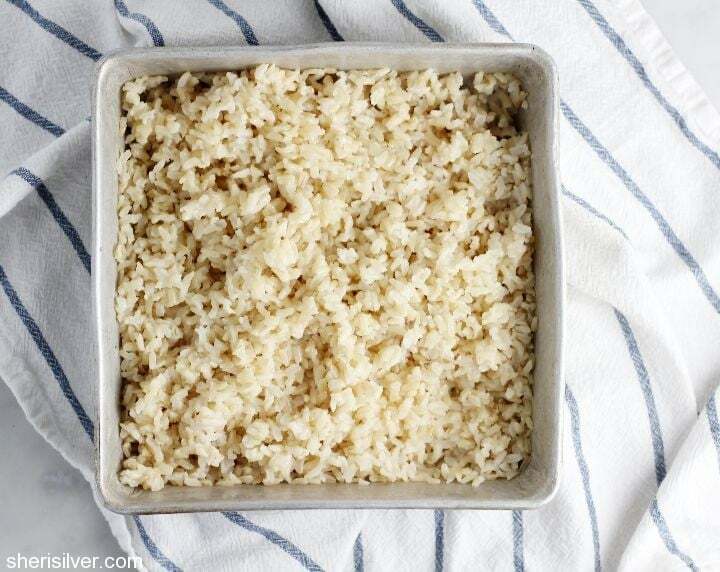 And I LOVE this method for brown rice, courtesy of Our Best Bites. Pre-heat oven to 375; spread 1 1/2 cups brown rice in an 8” square baking dish. Boil 2 1/3 cups water and 2 teaspoons butter (or oil) in a small saucepan. The moment it boils, pour over the rice and add 1/2 teaspoon salt. Cover tightly with two layers of tin foil and bake for one hour. Remove baking dish and uncover. Fluff rice with a fork and cover with a kitchen towel, making sure that the towel doesn’t touch the rice. Let sit for 5 minutes. Uncover and let sit for 5 more minutes; serve immediately. Let me know if you try either of these methods, or if you have any tips for making rice that you’d like to share! I boil my rice like pasta, lots of water a little salt. It takes about 10 minutes until its al dente. At this point I strain out the water with lid on the pot leaving some water behind or a reserve some water, maybe a quarter cup. I put the warm pot with the rice and water back on the warm stove gas /electric off with a bit of butter and put the lid on let the residual heat of the rice, pot and stove top finish the cooking, maybe 5 minutes. A nice thing to do with this method is adding a pinch of saffron and turmeric to the water for a bit of a mediterranean flair and then add some lentils and fried oinion/shallots once its cooked. Instant Mujadara. I make basmati white rice. Bring to a boil, cover & simmer covered for 15 minutes. Remove from heat STILL covered and let sit for another 5. Fluff with a fork. My Indian friend sautés chopped onions in veg oil and adds the rice. When it’s coated in oil then she adds the water or stock and simmers covered til done. I find using good rice helps a lot. No Uncle Bens! 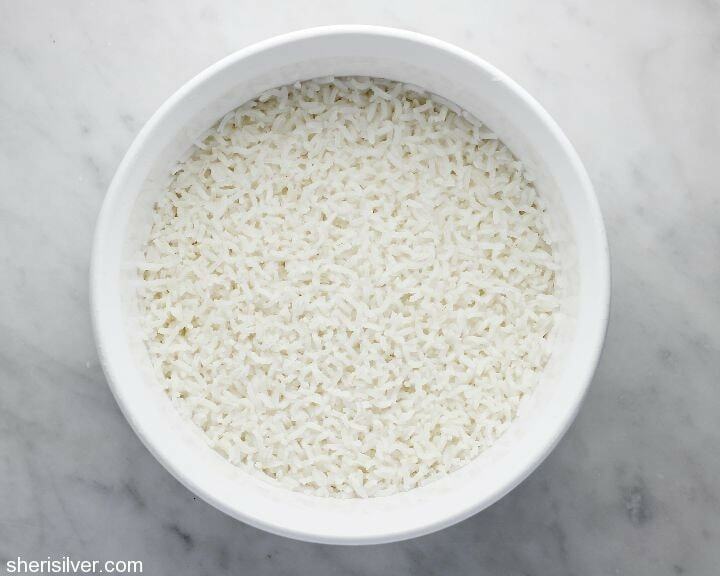 Yum – do you ever toast the uncooked rice first, before adding the stock/butter? I’ve done that – I mostly do it with Israeli couscous though rather than rice. I read somewhere (probably Martha) that you should always “toast the grains” before adding the liquid – makes sense…….. Thank you for the rice tips! I have a rice mission for you. I recently had a baked rice dish at someone’s house while on a business trip. It was delicious and made for a nice side dish for company. Anice variation. It was slightly creamy, but definitely cohesive. I haven’t been able to fet the recipe. If you know of anything like this, let us know. I suspect it was not low cal bc it was so yummy. No pressure!